Relaxing accommodations, exciting activities, remarkable scenery, to name a few!!! 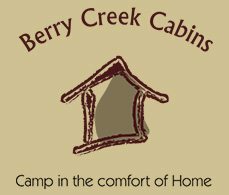 Berry Creek Cabins offers guests a wide array of cabin amenities to make their stay comfortable, relaxing and rejuvenating. Folks come to scenic Bogalusa, Louisiana, to get away from the hustle and bustle of their work and daily life. Berry Creek Cabins features everything that guests need to make their stay as carefree and refreshing as possible. There are also common household appliances in each cabin, including a full kitchen, as well as laundry access and spacious porches to enjoy the sights and sounds. From community and private hot tub access to soak away stress, to vacation games like horseshoes and ladder toss, there are plenty of options for visitors to unwind during their stay. There are also an abundance of leisure activities and scenic sites to take in throughout the region, including Insta-Gator Ranch, White Sands Lake and the Abita Brewery. Take a look below at all the great features guests have access to at Berry Creek Cabins, and if you’d like to make a reservation for the top cabin-styled bed and breakfast in Bogalusa, Louisiana, then be sure to contact us at 985-730-4395 or book online.